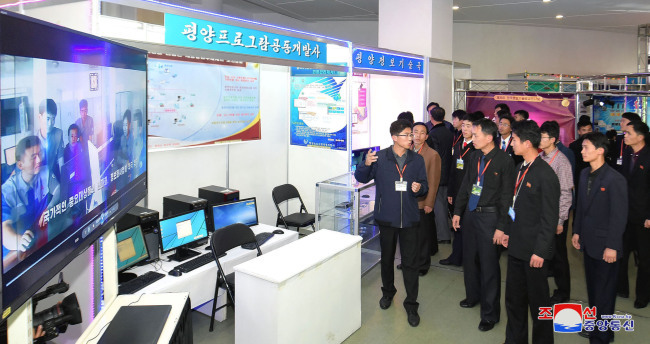 North Korea opened a national exhibition of information communication technology in Pyongyang on Wednesday, displaying the country's latest achievements in high-tech fields, the North's media reported. The 29th National Exhibition of IT Achievements opened with a ceremony at the Sci-Tech Complex in the North's capital, with more than 800 information science technology achievements on display, according to the Korean Central News Agency on Thursday. "The exhibition is divided into nine panels, including a panel for operating system and information communication networks, one for artificial intelligence and information processing and one for modernizing and automating production process," the KCNA said in an English dispatch. The agency also said that program contests, such as computer-added designing, machine translation, face identification and speech recognition, are to be held during the exhibition. In addition, lectures on global trends in information science and technology development and the IT achievements gained in the North will be given, it said.